The periodic table of digital resilience is a free resource produced by ParentZone. The table illustrates some of the challenges and dangers facing young people when they go online. Download the table by clicking here [PDF]. Download issue three of the Keeping Children Safe bulletin, released in October 2018. The Highland Child Protection Committee have made available ‘Child Protection Guidance and Toolkit for Community Groups and Third Sector Organisations‘. Click the button below to download the toolkit. This Guidance has been produced for larger Third Sector Organisations and those with a number of paid staff who should have robust child protection policies and procedures in place. 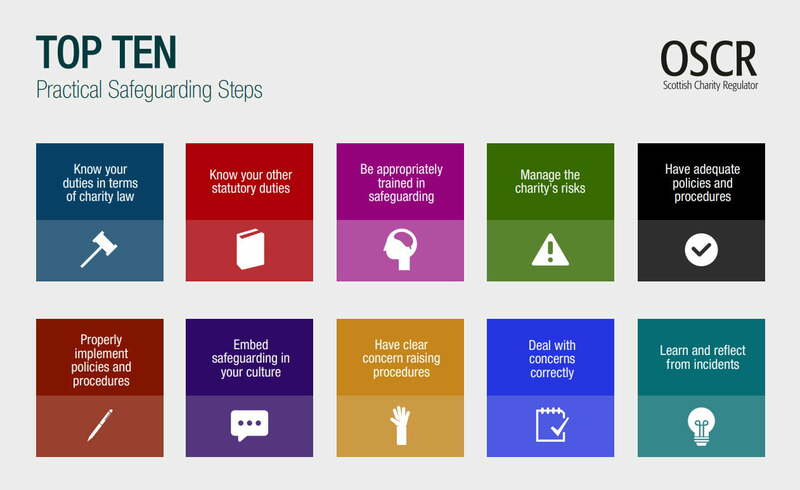 The guidance provides detailed advice on child protection issues, and tools to help support recruitment of staff and volunteers. For smaller organisations primarily using volunteers to provide activities for children, young people and families in Highland you may wish to download the Highland Child Protection Guidance for Community Groups. This may include sports clubs, arts and crafts groups, religious organisations or any organised groups/activities which involve regular contact with children and young people. Below you can find a video that provides more detail on what’s included in the Child Protection Toolkit. Click the thumbnail below to watch the video. Resources – where you can find a copy of the Highland Child Protection Guidelines as well as a range of local and national resources which may be useful to you. Training – here you can book on to training courses, access e-learning modules and find out what training you may need. Help and Advice – An up-to-date list of contact details for advisors and professionals who can be contacted if you have a child protection concern. Highland Child Protection Committee dedicated website launched! Click here to download a PDF guide to some of the apps and websites available to young people that aim promote positive mental health. Click here to learn more about information sharing on the Scot Gov website. This document provides advice on information on the following subjects: female genital mutilation, radicalisation, sexting and child sexual exploitation. The guide contains warning signs to look out for, as well as relevant organisations to contact. Download the document by clicking here [PDF]. Information, guidance and support materials are available from www.respectme.org.uk, Scotland’s very own Anti-Bullying service. Information for children and young people includes: What is bullying, What are my options. For adults there’s Guidance for parents/carers, Policy, Anti-Bullying practice including: Creating the right environment, Ways to respond and a range of videos and booklets you can download.